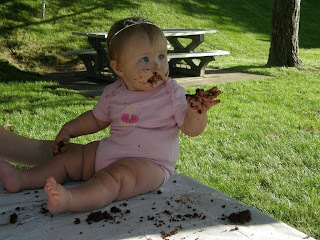 Hoose-Johnson Blog: Happy First Birthday, Bridgette! Happy birthday Bridgette! Did a shout out to you tonight as I ran by but you were in bed like a good girl. Hope you had a some great cake! I am a wife, a mother, and a graduate student. I’m currently researching mommy blogs, and I found your blog. I would appreciate your input about why you blog! If you would participate, please visit my blog—http://reflectionsofasheepishlion.blogspot.com—and answer my questions in your comment. Happy Birthday Bri!!! Isabella is viewing the blog with me now and waved at your picture with your new doll. Happy Birthday Bridgette! Isn't it amazing how much difference a year makes? Happy birthday! I wish we could have been there.